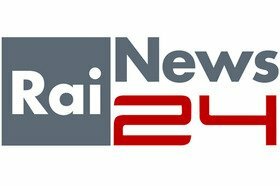 News TV Channel / Rai News 24 is Italy's first non-stop news and information channel, broadcast on digital terrestrial television in Italy and via satellite around Europe and North America. It is also the only Italian news channel to broadcast live 24/7 (similar to the fact that, every day, between 1am and 6am, when all the other news channels in Itália just play continuous replay loop, RaiNews24 is still LIVE to bring viewers late-breaking news). RaiNews24 broadcasts full national and international newscasts at the top and bottom of every hour, preceded by national weather forecasts. Traffic information from CCISS is also delivered every half-hour from 8:30 to 18:30 weekdays and from 7:30 to 19:00 weekends. The rest of the schedule has press reviews (morning & night) and various magazines.